In response to many requests from my last post, the purpose of this post is to discuss the 4 different wood burning stages of fire. We at Acucraft have adopted these standards and this post will differ from the chemical breakdown of wood. These stages are very important to understand when using an efficient wood burning fireplace or stove to maximize the BTU’s per pound of wood. 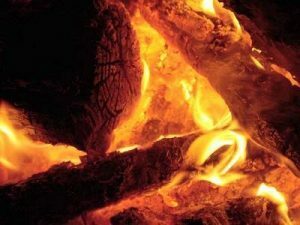 Many people new to efficient fireplaces stay in the creosote stage with wet wood, focus on getting your fire to be in stage 3. – The start up stage involves warming your fireplace flue and creating draw to begin pulling in the combustion air. We recommend starting with dry kindling and a fire starter, do not use newspaper. Many chimney sweeps will say the majority of creosote build up is caused by newspaper along with a cold flue. – Always start with dry seasoned wood, preferably under 20% moisture content. Add the dry split wood above the burning kindling fire. Always ensure there is proper flow for the smoke and heat to exit up the flue. The goal is to get out of this stage, the wood temperature will rise as it begins to burn. The moisture will be evaporating from the wood as it reaches 212 F and all the moisture will be out of the wood between 400 and 414 F. During this stage the wood will be hissing and bubbling on the ends. Keep the damper and combustion controls wide open during this stage, until you see the wood cleanly burning with out grey smoke etc..
– Once the wood has burned out the moisture and you have the combustion control dialed in, the flames will take on a slow moving orange flame. Maintain this type of burn for maximum heat and minimal creosote build up on your glass and flue. This stage can be maintained for 6-10 hours between loads of new wood, depending on your wood and your fireplace. – If you are going to let your fire go out in your fireplace, open the damper. During this stage, your flue will be getting colder at the top and when the cold meets with slow moving smoke creosote can occur. By opening your damper during this stage you are able to keep the flue warmer until the fire goes out. Learn more about wood burning fireplaces that we offer!